Please see the program below (under "Web and Social") for complete event details. This year, we welcome panelists from Brown, Concordia (Montréal), CUNY, Emory, Purdue, Rutgers, SUNY–Buffalo, Texas State, UCSB, UAlberta, UChicago, UVirginia, UW–Madison, and UT–Austin, as well as our own University of Michigan. In recent years, papers have been given in different Romance languages as well as in English; 2019 will be no exception as our program includes panelists from across languages and disciplines. 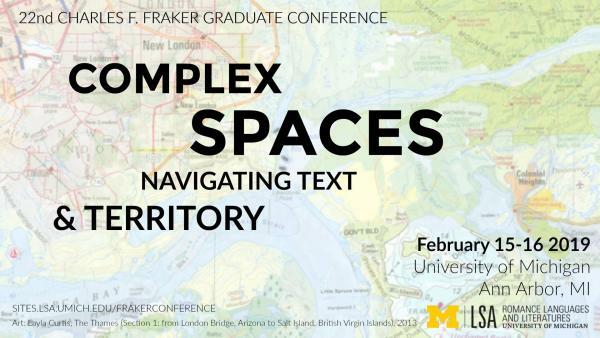 The conference will take place on the 15-16th February 2019 at the University of Michigan–Ann Arbor. On Friday, 15th February, it will be held in the Michigan League, and on Saturday, 16th February, it will be held in the Rackham Graduate School; both buildings are near Ingalls Mall on UM’s Central Campus. The keynote address will be delivered on Saturday at 5PM in the Rackham Amphitheatre.